Marc Chagall, was one of the most prolific artists of the twentieth century, whose bright, bizarre works from the time they fell into the rank of cult and put his name in line with the most famous masters of the art world. Enjoying life on the French Riviera, Chagall never forgot about his Jewish origin, including in the works referring to the scenes from the Bible. In the spring of 1931, being in search of religious motives for creativity, Marc Chagall went to the Holy Land. There he received life experience, both spiritual and creative. He created his series of “Bible stories” in 1931-1939 after his trip and resumed it again twenty-five years later in 1952-56. In the first part, based on his passion for religion, consisted of 105 engravings. The second series of works consisted of 24 color lithographs illustrating Bible plots; they were published in the Paris magazine Verve, and then printed separately from 1958 to 1960. Inspiration for biblical drawings Marc Chagall gathered not only by visiting the Holy Land. His own childhood in Russia had a great influence on him. The artist’s biographers claim that Chagall’s connections with the Bible were very deep, people from his own biblical world are part of his own inner life, part of the ever-living Jewish heritage. In the drawings, Chagall conveys the struggle and triumphs of humanity. Based on his own feelings of spirituality and faith, he carefully selected scenes, which he then illustrated. 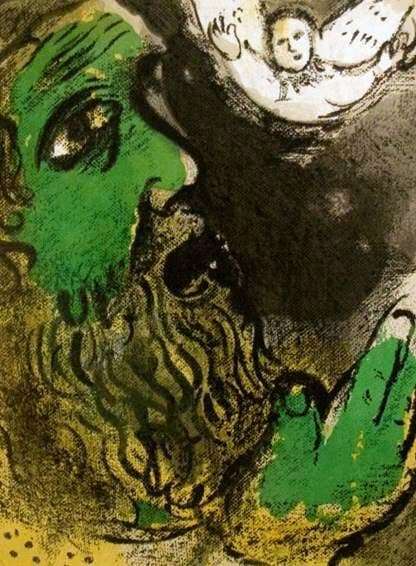 Using a bright color palette, dramatic shading and fancy images, Chagall evokes deep emotions with his amazing lithographic works on biblical scenes.